Happy Tuesday Proof Customers! First of all, I hope you’ve been enjoying Summer so far. We’ve been getting settled in our new hometown of Austin — eating tacos 🌮, riding Bird Scooters 🛴 to the lake, and enjoying the 95 degree 🌞 Texas weather. While our Marketing team has been out enjoying Summer, our Product and Engineering teams have been hard at work at the office developing some awesome new features for you. Export conversions with enriched profiles to a CSV file. Set click-through URLs for your campaigns. ^^ Hope you enjoyed the video tour of the office and the new product features! Lots of big things happening at our Texas HQ. 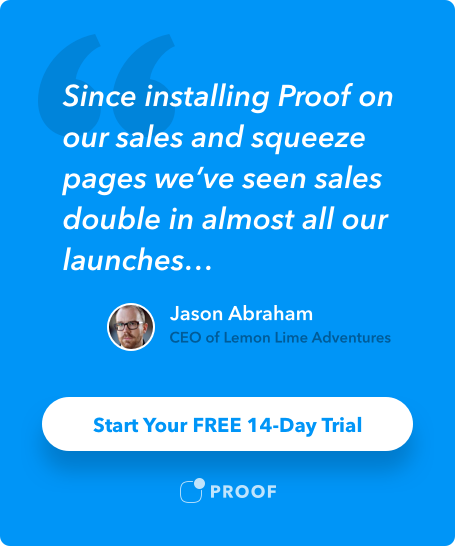 Want to see how Proof directly impacts your conversion rate? Now you can! With Campaign Metrics inside your Proof Dashboard, you can see how many page views, unique visitors, notification clicks, and captured leads you’ve generated in the last 24 hours. This is a feature that many of you have requested, and we’re looking forward to seeing how you use this new data to optimize your campaigns on a daily basis. With advertising costs rising, it’s now more important than ever to track your website conversion rate. Doubling your landing page conversion rate cuts your cost per lead in half! Luckily, now that you’re using Proof you are closer to accomplishing this goal. On average, Proof users see a 10-15% lift in conversion using Recent Activity and Hot Streaks notifications. The best news? More updates are on the way! Soon, you will be able to set the time frame, run A/B tests, and make other adjustments that will give you key insights into your website’s conversion rate. Leave a comment — and let us know what product and features would be most helpful in getting the most out of Proof. We’re all ears, and we directly use your feedback to decide what awesome new product features to launch in the next few months.